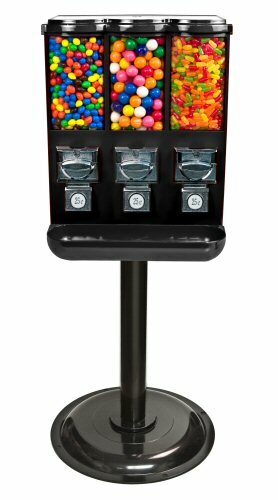 This 3 compartment bulk vending machine is one of the best values in candy and gumball vending. It features top-quality drop thru metal coin mechanisms and a durable all-metal body. All three canisters are removable. The compact design lets you offer three different product selections in one small space and is convenient to service. Now even more attractive and stable with the newer design heavy duty stand featuring a square post, and still within the same 16" footprint. Vends as pictured, with 2 candy compartments holding approx. 8-10 lbs each and 1 gumball compartment holding approx. 330 1" Gumballs, Bouncy Balls or Toy Capsules. Overall height of machine with stand is approximately 42 inches. These are best machines you can buy on the market, they take a lot of wear and tear, unlike most. The best element of these machines is the removable cylinders, which makes it exceptionally easy to replace candy and clean. 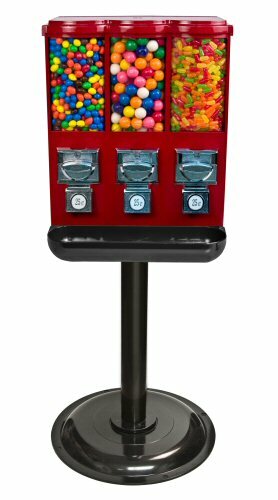 Also, parts are easy to replace and available right on candy machines.com. A few months ago I started a bulk candy vending machine business and could not be more pleased with the top notch service from www.candymachines.com. The machines are well built and the prices are great! I will continue to use this company to build my business. Thanks again for the outstanding service and product lines! Machine has a great look to it. Removable canisters are great. Only issue was that within 1 week of being placed the plastic catch tray fell off, the screws provided backed out and had to purchase and install new bolts that will not allow tray to be loose or fall off again. Other than that so far has been a great machine. I had the triple shop and this machine is better by a mile! I love the removable canisters. Thanks for your help candymachines.com!